The parish of Southsea was created on 7 May 1921, from part of the ancient parish of Wrexham, and parts of the parishes of Broughton and Brymbo. 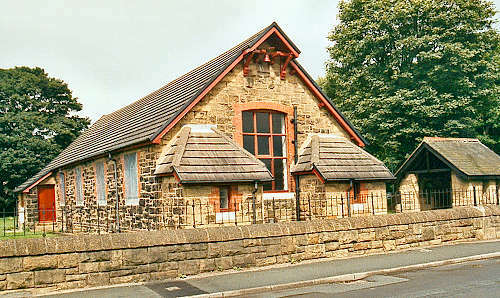 The present church (shown above) is the former church hall, which was consecrated for use as a church on 15 April 1984. There have been two earlier buildings, a few yards away. The first one was licensed and opened for divine service on St. Andrew's Day, 1884. In 1926, it was decided to demolish the original building, and replace it with a larger building on the same site. It is said that this was done by building the new church around the old one - which was then demolished! By the early 1980's, this second church had become unsafe. The Bishop of St. Asaph deconsecrated it on 15 April 1984, and it was demolished soon afterwards. For family history information about the church and parish, visit the GENUKI Southsea page.